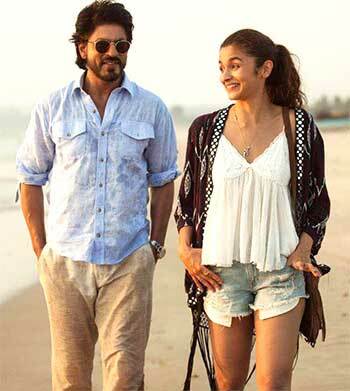 REVIEW: DEAR ZINDAGI'S HIGH ON SUBLIME ALIA, SPLENDID SRK! 'Who better than the flag bearer of celluloid romance to inspire a depressed, desolate heart?' asks Sukanya Verma of Gauri Shinde's fine film. Sad and sleepless is nothing unusual for a 20-something young woman fraught with career limbo and romantic disillusionment. What's significant is she decides to seek professional help for the same. Seldom does a character in our movies take such a step -- who needs a shrink when you can simply stand on the beach, balcony or backyard and drive all the gloom out of your system by blasting off an ode to melancholy? 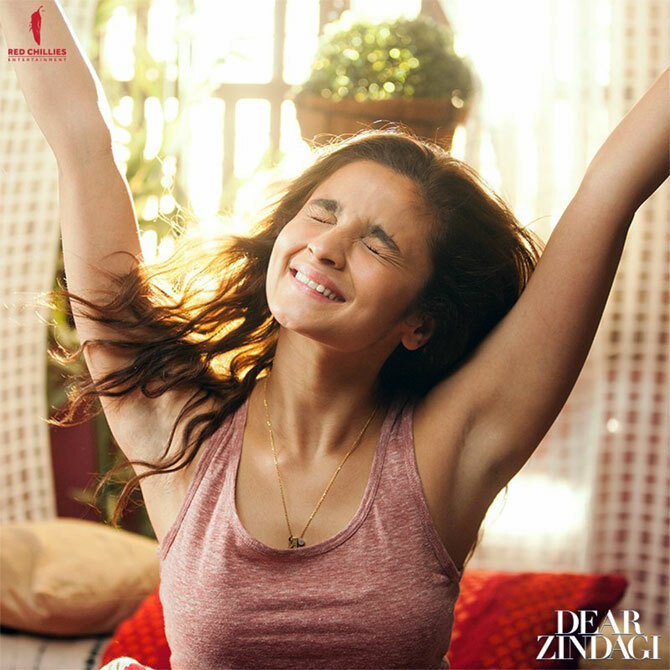 Gauri Shinde's Dear Zindagi frowns at mindsets that categorise pain on the basis of consequence or attach stigma to matters of mental health while making a glamorous case for psychotherapy. Expression is essential when stemming from feeling, not fallacy. A long festered wound dictates Kiara's (Alia Bhatt) mess and mood swings conspicuous in the Polaroids of changing suitors on her packed pinboard, the non-prescription glasses she sporadically wears, the phone calls she avoids, texts she never sends, a compulsive eBay shopping disorder (brazen show of product placement) and one-upmanship in the art of breakup. Evasive towards the men she dates and dumps (boring Angad Bedi, boring Kunal Kapoor, boring Ali Zafar), the budding cinematographer lets herself loose in the company of beer-glugging gal pals (lovely Ira Dubey, loony Yashwasini Dayama) and nondescript, William Faulkner-quoting wingmen -- enraged about everything from that elusive independent gig to Mumbai's inconsiderate landlords unwilling to accommodate a single working woman. Too disheartened to cope and young to know better, Kiara moves back to her native Goa. Except around her parents -- harmless, conventional folk unable to understand the source of their kid's discontentment -- she acquires the berating tone of Sridevi's impertinent daughter in Gauri's fine first film. If English Vinglish appealed to youngsters to be more gracious of their parents' disadvantages, Dear Zindagi points out the impact of callous parenting in the long run. Dear Zindagi picks its supporting cast with care. The actors impart tremendous believability to the steadily growing unrest in Kiara's household resulting in telling family scenes around typical desi requirements of a 'proper job' and ‘getting married' at the 'right age.' Not to mention the entitlement in the extended family's unsolicited curiosity and counsel. 'Are you a Lebanese?' one such 'well-meaning' uncle probes refusing to accept Kiara's singledom or his poor vocabulary. Yet Gauri has a knack for noting the inherent chauvinism and prejudices without demonising anyone. One can gauge her optimism in the manner she straightens out Kiara or introduces Shrink Charming, Dr Jehangir Khan (Shah Rukh Khan) in her life. Who better than the flag bearer of celluloid romance to inspire a depressed, desolate heart? Dear Zindagi's smooth channeling of our favourite bits of SRK's personality -- affable, charismatic, eloquent, refined, witty, unshaven -- wears itself crisp and light, pretty much like the linens he sports. Gyaan becomes him even when the quality of Dear Zindagi's wisdom is too banal to dazzle. When not playing the unorthodox sounding board or decoding her bizarre dreams inside his elegant office, he tells Kiara: Relationships are like chairs, try out as many until truly satisfied. Goldilocks might approve of this analogy but it's hard to see any appeal in Kiara's bears, er, beaus except good looks. Tossed in and out of the narrative like dispensable tissue, they form the most cumbersome chapters of her lacklustre love life. As do the final 15 minutes devoted to winding up every single plot point, down to the last rambling detail, which deprive Dear Zindagi of a lyrical finish. What comes away unscathed is Alia's compelling vulnerability as she gently reveals the reason for her pent-up resentment, which is not some dramatic disclosure laced in hysteria but a child's exaggerated reading in compulsions of grown-up life. Alia is remarkably perceptive and there's a catchy rhythm to her interactions with SRK neither ever forgetting she is principal, he is peripheral. The breakthrough she makes, the healing he offers, the bond they form extends across the screen. And so when she takes a mental picture of the room and him in the best scene of the film, you know they've quietly progressed from dear to dearer.